Nigeria hope to have avoided a lengthy ban from Fifa after a regional high court overturned its recent decision to void last month's football elections. President Goodluck Jonathan intervened on Wednesday to end the crisis. Fifa has not confirmed if Nigeria will escape a ban which would run until May. Football's world governing body wrote to the NFF on Tuesday, warning them the latest instance of government interference - prohibited under Fifa rules - risked the country being banned from global football until the next Fifa congress. On Wednesday President Jonathan held talks with the two main protagonists in the long-running NFF saga, the Fifa-recognised president Amaju Pinnick and the man who claims he should have the role, Chris Giwa. The president then ordered Giwa's associates to withdraw their case which had led to the ousting of Pinnick. And on Thursday the legal action, which had been initiated by two members of the previous NFF executive led by Giwa, was stripped of its authority. 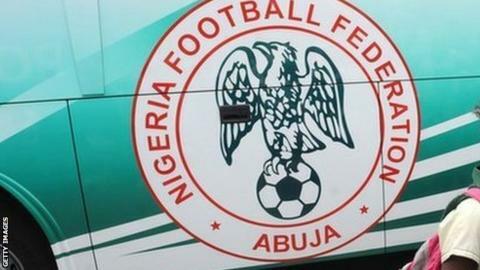 BBC Sport understands reinstated NFF officials have subsequently communicated to Fifa the latest developments in the hope that the governing body will ease its stance. Nigeria are desperate to avoid being thrown out of qualifying for next year's Africa Cup of Nations, which would also mean they would miss the chance to defend the title they won last year. Meanwhile, Stephen Keshi could be set for a surprise return as coach - also seemingly an outcome of President Jonathan's intervention. Keshi, who led the team to Nations Cup glory last time out and also steered them to the last 16 at this summer's world Cup in Brazil, was sacked earlier this month because of the team's recent struggles. But it is believed his return has been ordered so he can oversee the team's final two Nations Cup qualifiers next month that will determine whether they make it to Morocco. Keshi, who was in talks on Thursday with sports minister Tammy Danagogo, said he was unaware of any presidential intervention. But the 52-year-old added: "If the president of my country asked me to return, who am I to refuse?" Nigeria play Congo-Brazzaville in Pointe Noire on 15 November 15 and South Africa in Uyo, southeast Nigeria, four days later. They need to not only win both matches but beat Congo by a margin of two away goals to stand any chance of automatic qualification.